Remember that time at sock camp.. Okay, sorry couldn't help myself. This is a Rare Gem STR in medium weight Picked up at camp and finally meeting it's destiny as a pair of socks. I love the idea of socks: portable, semi-quick, you can never have too many, endless amounts of fantastic yarn and patterns to choose from. All good stuff. The only downside of socks is that my hands cramp up after only 20-30 mins. of knitting. This is a big down side and the reason it takes me forever to finish a pair. I bought a set of Knit Picks DPNs and tried them with medium weight, so I could use size 2 (normally I magic loop and use light weight). Good news is, it did seem to help the cramping a bit. Bad news is, I still hate DPNs and it took me twice as long to knit with them. My big problem with the DPNs for socks is that I want my socks to be my potable, pull it out when I have 5 extra minutes project, and with the DPNs all that picking up, putting down, and being shoved in to my purse, ended up in needles falling out or yarn wrapped willy nilly around the needles. By the time I'd get it all sorted out I'd have to put it back down. This is not even counting the number of times I jabbed myself with a stray needle while searching for something else in my bag. So I'm not sure DPNs are going to be a good solution for me. Although I did come up with some inventive cursing for when children are around ("Son of a Banana!" being their fav) . Any other suggestions? Anyone else have the same problem? 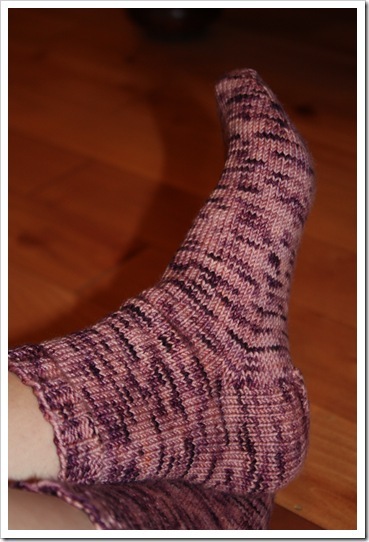 PS - if you need all the gory sock details check Ravelry. Have you tried 2 circs? my grip on them is signifigantly different than DPNs, I use both comfortably but it might work. I like the look of those wip tubes! I have the kind of dpn holders that are two caps with elastic between, and they kind of bend my dpns. I love dpns more than magic loop or two circs, but if you're committed to circs, why don't you try size 2 circular for magic loop, and the medium weight yarn you used? Would that be a decent compromise or do you want thinner socks? 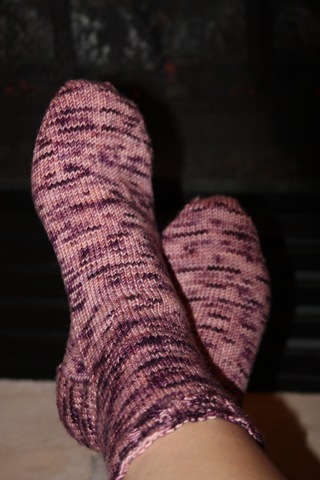 I'm not patient enough to use skinny skinny yarn, so I like sport weight socks! Those socks are too cute!! Does it matter if its a size 2 and magic loop? 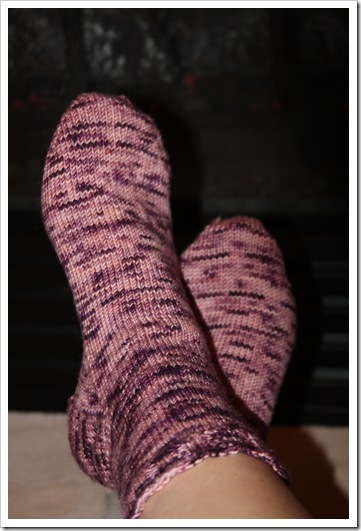 We've got to figure out how you can knit more socks (because then you can buy more sock yarn..hehehehe!). They look great and I love that they made you invent new curse words.